This Nike colorblock jacket is SO popular right now! I purchased it for my dad for Christmas and he loved it. If this color isn’t your favorite, it is available in many other colors. For more of a classic gift, I suggest a Patagonia jacket! Like the Nike one, this one too comes in other colors. 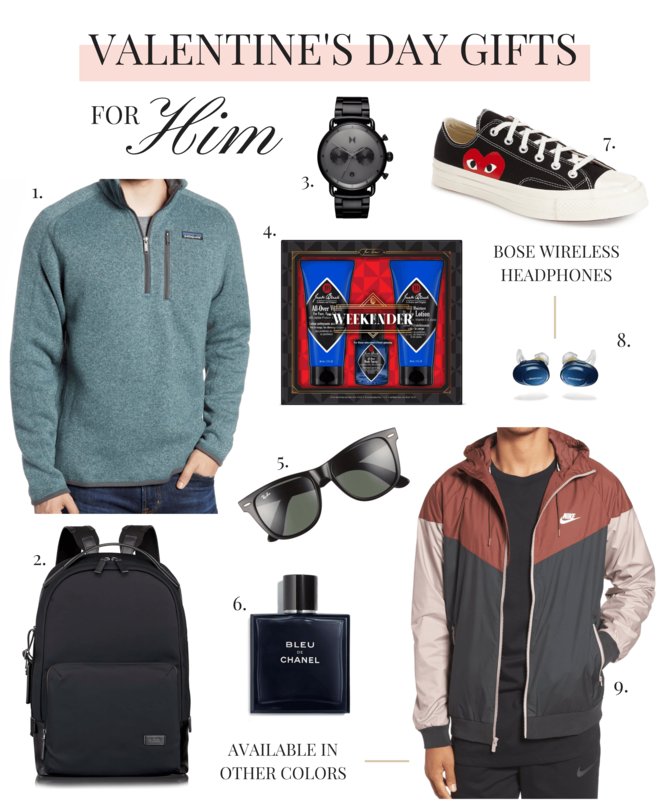 While guys tend to not accessorize as much as girls, you can never go wrong with getting your guy a nice watch or sleek pair of sunglasses. If you’re looking for a new cologne to get him, I highly recommend picking up Bleu de Chanel! Also, I think these wireless Bose headphones are the coolest thing! While AirPods are great, I think these are better for exercising! Hopefully these picks help speed up your Valentine’s Day shopping! For those visiting My Styled Life for the first time, I encourage you to sign up for my mailing list so that you are always the first to know when new posts go live! The best part is that subscribing is easy! If you’re reading on a desktop, head to the righthand sidebar to sign up. For those reading on a mobile device, scroll to the bottom of my site to sign up! That way, you’ll never miss a blog post! Thanks for reading! Have a Happy Valentine’s Day! Comment below to let me know what you’re doing for love day!